Wartime images by Soviet artists feature on British postage. Art Russe’s collection of Russian art has issued a block of postage stamps featuring reproductions of famous Russian art. 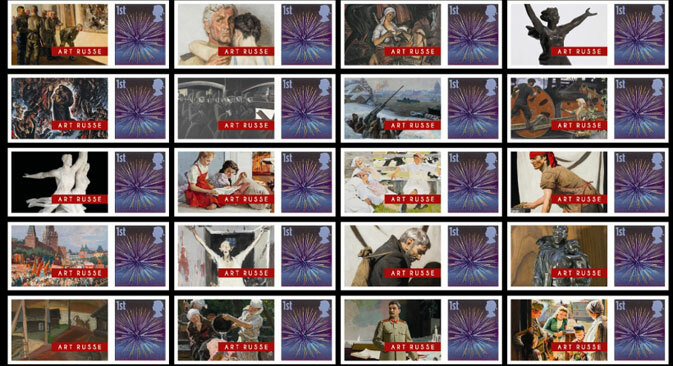 The landscape sheet, consisting of twenty first class stamps, has images of paintings and sculptures from the Art Russe foundation’s collection. The designs are based on artworks that were displayed in March at the first UK exhibition dedicated to the end of the Second World War and its reflection in Russian art, hosted by London's Saatchi Gallery. Famous works were chosen for the commemorative issue, including elements of Vera Mukhina’s famous “Worker and Kolkhoz Woman” statue, Evgeny Vutetich’s “The Motherland Calls”, Alexander Laktionov’s “Letter from the Front”, Ivan Penteshin’s “The Defense of Leningrad” and Mai Dantsig’s canvas “Partisan Ballade". The main focus in the limited issue is on Soviet artists but there are also some stamps with modern Russian works, such as “Spring in the Depo” by Viktor Popkov, Tatiana Kopnina’s “Girls” or Nikolay Baskakov’s “Milkmaids”. “Based on our previous projects, there’s huge interest abroad in art from Russia, particularly in the UK”, Lavery said. “For instance, our exhibition “Exploring the legacy of WWII in Russian art” was seen by more than 20,000 people over the course of three weeks." The stamps are available via the website of the Art Russe foundation.